Jeremiah 2:16 The children also of Memphis and Tahpanhes have broken the crown of your head. Jeremiah 46:14 Declare in Egypt, and publish in Migdol, and publish in Memphis and in Tahpanhes: say, Stand forth, and prepare; for the sword has devoured around you. Jeremiah 46:19 You daughter who dwells in Egypt, furnish yourself to go into captivity; for Memphis shall become a desolation, and shall be burnt up, without inhabitant. Ezekiel 30:13 Thus says the Lord Yahweh: I will also destroy the idols, and I will cause the images to cease from Memphis; and there shall be no more a prince from the land of Egypt: and I will put a fear in the land of Egypt. Ezekiel 30:16 I will set a fire in Egypt: Sin shall be in great anguish, and No shall be broken up; and Memphis shall have adversaries in the daytime. Hosea 9:6 For, behold, they have gone away from destruction. Egypt will gather them up. Memphis will bury them. Nettles will possess their pleasant things of silver. Thorns will be in their tents. The ancient capital of Egypt, 12 miles South of the modern Cairo. This Greek and Roman form of the name was derived from the Coptic form Menfi (now Arabic Menf), the abbreviation of the Egyptian name Men-nofer, "the good haven." This name was applied to the pyramid of Pepy I, in the cemetery above the city; some have thought the city name to have been derived from the pyramid, but this is unlikely, as the city must have had a regular name before that. It may perhaps mean "the excellence of Mena," its founder. It appears still more shortened in Ho (9:6) as Moph (moph), and in Isaiah (19:13), Jeremiah (2:16), and Ezekiel (30:13) as Noph (noph). The classical statements show that the city in Roman times was about 8 miles long and 4 miles wide, and the indications of the site agree with this. It was the sole capital of Position Egypt from the Ist to the XVIIth Dynasty; it shared supremacy with Thebes during the XVIIIth to XXVth Dynasties, and with Sais to the XXXth Dynasty. Alexandria then gradually obscured it, but the governor of Egypt signed the final capitulation to the Arabs in the old capital. While other cities assumed a political equality, yet commercially Memphis probably remained supreme until the Ptolemies. The oldest center of settlement was probably the shrine of the sacred bull, Apis or Hapy, which was in the South of the city. This worship was doubtless prehistoric, so that when the first king of all Egypt, Mena, founded his capital, there was already a nucleus. His great work was taking in land to the North, and founding the temple of the dynastic god Ptah, which was extended until its enclosure included as much as the great temple of Amon at Thebes, about 3 furlongs long and 2 furlongs wide. To the North of this was the sacred lake; beyond that, the palace and camp. Gradually the fashionable quarters moved northward in Egypt, in search of fresher air; the rulers had moved 10 miles North to Babylon by Roman times, then to Fostat, then Cairo, and lastly now to Abbasiyeh and Kubkeh, altogether a shift of 18 miles in 8,000 years. After the shrine of Apis the next oldest center is that of Ptah, founded by Mena. This was recently cleared in yearly sections by the British School, finding principally sculptures of the XVIIIth and XIXth Dynasties. The account of the north gate given by Herodotus, that it was built by Amenemhat III, has been verified by finding his name on the lintel. An immense sphinx of alabaster 26 ft. long has also been found. To the East of this was the temple of the foreign quarter, the temple of King Proteus in Greek accounts, where foreign pottery and terra cotta heads have been found. 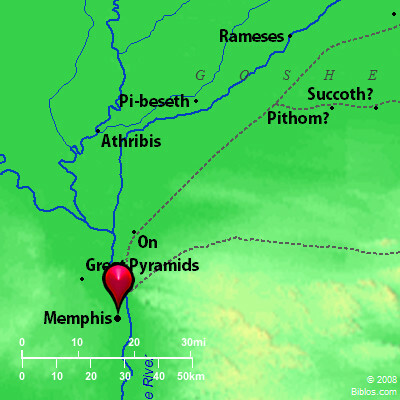 Other temples that are known to have existed in Memphis are those of Hathor, Neit, Amen, Imhotep, Isis, Osiris-Sokar, Khnumu, Bastel, Tahuti, Anubis and Sebek. A large building of King Siamen (XXIst Dynasty) has been found South of the Ptah temple. To the North of the great temple lay the fortress, and in it the palace mound of the XXVIth Dynasty covered two acres. It has been completely cleared, but the lower part is still to be examined. The north end of it was at least 90 ft. high, of brickwork, filled up to half the height by a flooring raised on cellular brickwork. The great court was about 110 ft. square, and its roof was supported by 16 columns 45 ft. high. The principal sights of Memphis now are the great colossus of Rameses II, the lesser colossus of the same, and the immense alabaster sphinx. The cemetery of the city is the most important in Egypt; it lies 2 miles to the West on the desert, and is known as Saqqareh, from So-kar, the god of the dead. MEMPHIS, in Hebrew, Noph; about 10 ms. s. of Cairo, 10 ms. s.e. from the great pyramidsa little village Mit Rahineh occupies a small part of the ancient site which is 1 1/2 m. w. of the Nile.